Riku Eskelinen, candidate for the Centre Party in Helsinki, 36 years old, is a very special person, in addition to being a candidate for the Centre Party in Helsinki. He has been an activist for democracy, which had as a consequence that he has not been so welcome in Belarus – he has had the strange idea with his friends to monitor without a formal invitation the votes during a presidential election campaign some years ago. He continues to keep an informed eye on the developments in Russia, in Belarus, in Ukraine and in Georgia, and organized recently a debate on the future of Ukraine with politicians from these countries. Particularly involved in ecological matters, he has worked for a long time in environmental organizations and politics, and is currently the manager of the EKOenergy network, EKOenergia. 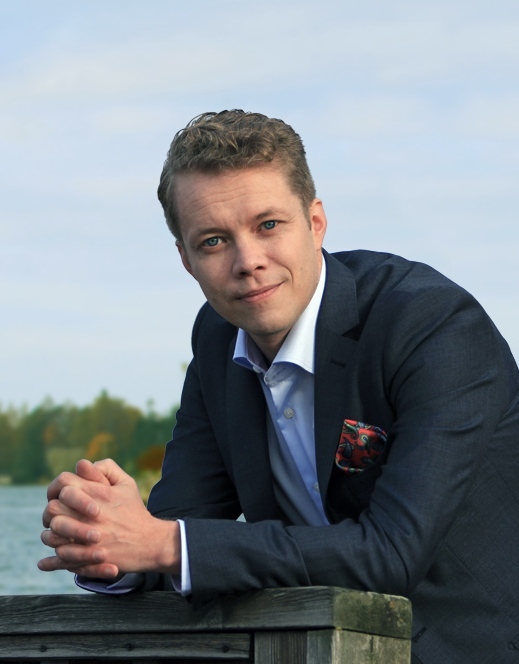 He was also an assistant to a Member of the Finnish Parliament (Antti Kaikkonen), a climate expert and lobbyist for WWF Finland, member of the Board of LYMEC, European Liberal Youth, and member of Helsinki Environment Committee. After your studies, I understand that you have been what is called an activist? Yes. When I finished my studies in international business, I immediately found myself working in a political party. I worked in import and export business, but that was not really my thing. I found my way as a political activist, and as an environmental activist. You have been involved in activities in Russia and Georgia, in particular? Yes, that was important. I started in environmental NGOs in 2008, then I let go of all my political activities. Before that, I was a member of the board in the European Liberal Youth, Lymec, and then as the Vice President of the Nordic Centre Youth, NCF. During those times, I participated in a lot of missions in Eastern Europe, and in particular I organized myself some election observation missions and fact-finding missions in Russia, Belarus, Azerbaijan, which is a zone that interests me most. I understand that you have been quite involved in politics. Why did you choose to go to the Centre Party? Everybody always asks this question! I was always somewhat interested in the Centre Party. I thought that the National Coalition Party (Kokoomus) is also a good party, but in the end, I felt that the Centre Party is a good party, where I have been much more welcome. Very different people are accepted in this party, which is rich of the differences between its members, and in addition I like the idea of a decentralization of power, which is central to the party. Being interested in environmental questions, I could have considered the Greens, but I had the feeling that it is a party run by a few people, they were a bit too elitist for me, and the same goes for some other parties such as the National Coalition Party. They are not really big movements of citizens, as we are. The Centre Party, for me, is great, with so many different kinds of people from different backgrounds, and I felt that this party is really democratic itself with tens of thousands of people really participating. That influenced me. What do you feel are the main challenges for Finland for the next four or five years? One of the main challenges are growing government debts. We can not take more and more debts year by year. It’s impossible. We also have a lot of people who are in a risk of dropping out of the society, or who have already dropped out. The number of these people has been growing, so there is a gap between rich people or wealthy people, let’s put it that way, and then those people who have difficulties in their lives. That gap is growing. That’s another big challenge.We have also a huge problem of our lifestyle. We are consuming much more than the planet is producing,That the future of our planet. How would you address these challenges for Finland? It is a difficult question. I would start with the last one, with the problem of sustainability and the problem of human beings consuming too much. I think that Finland needs to address first the energy politics side, as energy is one of the biggest problems, if you think about our ecological footprint. There are two questions: first, how much we consume, and then, how the energy is produced. In Finnish politics, everybody agrees that fossil fuels are a little bit of a bad thing, and we should increase the share of renewable energy. Then we discuss about details but not a lot is done. We lack a clear vision of where we should be heading to. Because of Energiewende (the German energy transition) Germany has now a clear vision where the country is heading in energy politics. That brings predictability for their energy sector, long term investments are possible and Germany gets also competitive advantage on world markets. Finland needs something like that as well. We actually gathered a group of different people from different backgrounds, who started to work at the end of last year on the Finnish Energiewende, the Finnish energy switch. That is now known as Energiaremontti (www.energiaremontti.fi). I am heading its political work. It is not a copy of the German one. But, it has taken some ideas from it, in particular the setting of a clear target for Finland as a nation: running 100 percent with renewable energy by 2050. When we will have a clear understanding, and if we can get the support from all the different parts of the society, from the companies, from the political parties, from the environmental NGOs and from other NGOs, from the labour unions, from the church, when everybody will agrees that this is how Finland should be, we will have started something great, a big movement. This movement of citizens makes it possible to go further than just to agree that renewable energy is better than fossil fuels. We have to also reduce our energy consumption, for instance by reducing our heat consumption at least by 70 percent. All this is something that I think would be the only way to get Finland back on track of being one of the world leaders in renewable energy.On the global level, we have this huge boom of renewable energies. There’s a lot of big investments, a lot of money going on there, but last years Finland has not attractive at all, from the international investor’s point of view, due to its weak energy policy. We have some investments in the nuclear power, but that’s all. It has nothing to do with renewables. Ernst and Young publishes a study called Renewable Energy Country Attractiveness Index, which analyses how interesting different countries are if you want to invest in renewable energy. In that index, Finland is as attractive as Nigeria and Russia, so among the very last ones. That is what we need to change, and it can also bring in new jobs, money to our economy, if we can make ourselves get new Nokias for the energy sector. What about the other challenges? They are linked, because when we develop Energiaremontti, this new energy policy, we have a positive impact on the economy and the employment. Now we are missing and losing this huge momentum, this big new energy boom, and it affects our economy. When the economy will do better, we will have the possibility to help people, and fight inequalities. This is in a way a long-term vision, but we still have these short term problems: the government debts are growing, and there is not a lot you can do. We can cut down the expenses or to increase taxes and other state incomes. But now it looks like that we have to cut down expenses. I would cut first the tax reductions to energy intensive industries. At this moment we cannot afford giving them tax reductions. I would also cut on the defence budget, actually. It’s funny that we have this kind of consensus between all the parties to increase these expenses. Everybody looks like to agree that we should continue to use more money in the army. I’m not so convinced that this is a good idea in these difficult economic times. The army is a big part of our budget, and other countries show that there are ways to be more efficient, to do things differently and spend less. As we are in the social domain, what is your opinion about the privatization of social and health services? In the health care field, there can be room for private providers, but public services are more important. And we need to change something which is a major injustice: the inequality between the people who have a work and those people who are not at work, because when you have a work, your get a much better healthcare through your employer than the others. This has to be corrected! More generally, being the Centre Party, we are somewhere in between the National Coalition Party and the left wing parties, with the latter trying to hinder private health care companies and with the National Coalition Party looking down on the role of public services.We are in the middle, which could be a public-run service using private providers when it is useful. What about the social domain? I am in favour of the system of basic income (it is an income unconditionally granted to all on an individual basis, without means test or work requirement), which would allow to make simpler the bureaucratic social system which functions now. The administrative costs would be reduced, and it would give a good incentive to go back to work for unemployed people, which is not always the case now. In addition, it is a good tool to fight inequalities. And I feel that with a government with the social democrats, it would quite possible to do it fast, as indicated in our programme. In the social field, there are some parts in the budget that I would increase as soon as it will become possible. For instance, I am quite old school for the support to the families. For example, when a family with children is in real difficulty, municipal housekeepers could take care of the kids, clean and do the house work. It was very popular in the 80s, and I saw that in my home, when we had problems: when my mother died, we always had somebody at home, who took care of us and who was cleaning, making us food when my father was not able to do it. This kind of help is almost impossible to get nowadays. With these kinds of services, you can detect early the problems in the families, and do something before things get worse. After your election, what would you like to be the first law arriving on your desk for adoption? I would like to see a framework law concerning the energy policy, encouraging the reduction of the use of energy by renovating the buildings, and indicating the general objective of going towards 100 percent renewable energy in 2050. This may happen if we win the elections. In addition, I would also very happy to see that we forbid the use of coal in 2025, for instance. That is what we demand also in Energiaremontti. That would be brilliant. In the international field, what is your position about the Greek situation? The Greek situation? It has been a long story, and it is going to be a very long story, I think. It’s an interesting story also. I think we need to show solidarity, and to help other European countries to avoid a total collapse. But what is the right way to do it in Greece? What I expect from the Greek political leaders is honesty, that if they take more debts and if we are guaranteeing their debts, I’m expecting that they will tell the truth also, and that they pay their debts back. Or if they can’t pay the debts back, that they say honestly, “We can’t pay the debts back, and we need just your help and your money.” Then I would be ready to discuss about that with them. And even to help fund other countries in trouble. The problem is that I am not really 100 percent sure if I can trust the Greek political leaders. They have not been so trustable. And in the current situation, with the new government, I don’t know what their goal is now, when they are negotiating for new loans. It looks more like it is not a loan that they expect, but funding without return. More generally, I am not satisfied with the EU politics. I think there was a good drive in the mid-90s, with the enlargement of the European Union. But after we got Central European countries as our members, we kind of stopped. We felt like, “Oh, now we cannot give anymore.” We left Ukraine and some other countries dropping somewhere between Moscow and Brussels, and this is now causing them, and us, a lot of problems. We should have given all countries the same possibilities. I mean, we helped a lot for example Czech Republic, Estonia, Lithuania, to fit the EU membership criteria, but with Ukraine, we know that they do not fulfil them, but we are not even helping them to fulfil them one day. What should we do now that we have this situation with Russia? We should concentrate in helping democratic movements in Ukraine and in Russia. But, Finland should remain outside of NATO also, outside of all the military alliances. Russia is not going to be any kind of military risk for Finland, I don’t think so. They would attack all of their other neighbours before us, for example Mongolia, Kazakhstan, Kyrgyzstan, Estonia, Latvia, Lithuania, Poland… Finland would only accelerate the crisis. I believe in diplomatic solutions to the present crisis. And I feel that Finland should be much more active also with the relations with Russia. I think that it is true for all the EU, actually: we need some kind of vision for how a common Europe would like with Russia as part of that Europe. Now we are building up two Europes: one run by the Kremlin, by Moscow, and one by the EU, by Brussels. What we need is to show up some kind of better future. Let’s put 2050 again as a deadline. I would like to see a Europe where you have Russia maybe as a member of the same European Union that we are having with the other EU countries. It means that Russia has to change a lot, a lot, a lot! Probably also we have to change. But I would like to give this hope for the people and for those people who believe in European values in Russia. I would like to give them the feeling that it is possible. This is something that I think we should work much more on. My last question would be about the immigration in Finland. I have seen that the municipalities have announced that next year they will take less refugees. At the same time, there is a push from the employers to recruit more immigrant workers in Finland. What is your opinion on this topic? When I hear this, it looks very funny for me, because when I was a kid, I was living in a small municipality in a small village. If you saw a foreigner or an immigrant visiting our village, it meant that we were successful, that we were doing well, we were attractive and we were proud of that. I think that we should, first of all, understand that foreign people coming to us is a sign of success, a sign that we are doing something right, isn’t it? Then the question is, do we need more immigrants? Maybe not, maybe yes. For me, it’s more important that everybody should have a right to decide where they live and where they work. If somebody from Russia or from Nigeria really wants to move to Finland, wants to live his life here, I would not try to make it more difficult, I would help him or her. Then there are, of course, people who need help, who come from war zones, and then that’s a common responsibility of all the countries, to help these people. I think we could do more in that.